Brendan Cope walked into the news conference room sporting his all-black uniform, a once-a-year tradition for the Bobcats. Cope was going to get his fifth mug. Each Ohio player receives a ceramic mug when the team defeats Miami, its rival. The mug has a Bobcat on it, as well as the score of the Miami game and the team’s season accomplishments. 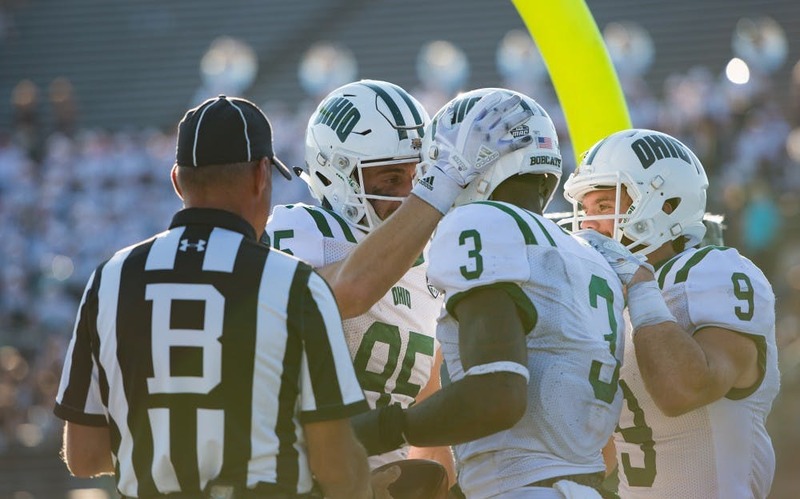 The Bobcats defeated the RedHawks 45-28 in Peden Stadium on Tuesday, picking up their fifth straight win in the “Battle of the Bricks.” Cope, a redshirt senior wide receiver, will have his last mug after the season to complete his collection. He’ll leave the program without ever having lost to Miami. Cope, who has battled turf toe this season, didn’t play in Ohio’s previous game against Kent State. Up until that game, Cope had played through the injury. But he simply couldn’t play against the Golden Flashes. He needed to rest, and he could do so at the right time, too. Coming off the Kent State win, the Bobcats had a 10-day break. The Bobcats needed time to heal, and Cope was one of those players who benefited from the respite. “A few extra days helped us an awful lot,” coach Frank Solich said. The game against Miami marked Cope’s first game back. Against the RedHawks, Cope played well: He caught a 40-yard touchdown pass from Nathan Rourke in the first quarter, and he led the team with 89 receiving yards. As Cope sat at the table, his eye black was smeared under his eye. He relished in defeating a rival, one last time. The last time the Bobcats came close to losing to the RedHawks was 2014. On the Bobcats’ last drive of that game, Cope caught a 38-yard pass from Derrius Vick to set up the game-winning field goal. Last Friday, he said that was the best moment of his career, and he didn’t know if he’d be able to top it. This latest win is close. Previous wins and performances don’t matter against Miami. Cope and the rest of the team didn’t know the feeling of losing to the RedHawks, and they didn’t want to. But after this season, Cope will officially be an alumnus. He won’t be coming onto the field at Peden Stadium next season, preparing for another Miami week. Just like former players are still invested in the rivalry, Cope will be, too. He’ll be looking at his mugs, drinking coffee out of them in the mornings. What kind of coffee will he drink?